First a note about TCL, a manufacturer that few are familiar with in North America. This is a huge company with a $4B panel manufacturing facility in China. They also have a research facility in Silicon Valley and claim to be the third largest manufacturer of TVs in the world. Picture quality including blacks, contrast, and color is not the standout feature of these TCLs. Black levels suffer turning more bluish black at times. From side angles contrast and color saturation degrade worse than the average LED backlit LCD TV, but less than expected. This begins at around 15 degrees off-center. Motion blur is rarely visible, though judder (side to side jerky motion especially present when a camera pans slowly) is present due to the fact that there is no refresh rate smoothing features present in the TV. Even though TCL states that the TV is 120Hz, it's actually a 60Hz native panel. Another exception to the specifications is that this is not the full array direct lit backlighting you should compare with top quality and brands. In this case, full array direct lit LED to LCD is just an economical way to produce the TV much like some of the very small inexpensive 32” models we've seen from other manufactures. This is evinced by screen uniformity that is weak both on black and solid medium grays. This means that you may see some clouding along the edges or corners when displaying a black or very dark screen. From our experience with LCD TVs, it may become more pronounced over time. With a gray or medium color screen you may see some darker shadows in various areas of the screen. When viewing our stock Fifth Element BluRay we noted some inaccuracy in colors with a red push causing flesh tones to look flushed. Greens are also difficult for the TV to produce accurately. On the positive side, I was impressed with the brightness produced. All of that said, the picture is acceptably decent is the best way I can put it. It's certainly not bad and a bit better than we expected. You aren't spending a lot to get a superior panel or color performance on this TV. That's not its strong suit. For the price, the picture is actually very good. Technologically, the 1080p resolution screen is backlit with direct full array backlighting, though not with local dimming zones as seen on high end LED TVs. The picture settings menu is very simple with not many options for fine tuning color. There are 5 preset picture modes. Preset Picture Mode Options include Sports, Normal, Vivid, Low Power, and Movie. The Movie mode is the most natural and accurate with color temp set to War. You will want to immediately change the TV Brightness setting to Normal to Dark depending on the room light conditions. It's also important to note that the Picture Size settings for Aspect Ratio are located in the Advanced Picture Settings Menu. Options are Normal, Auto, Direct, Stretch and Zoom. We found ourselves using the Zoom option several times to fill the screen. Gaming Picture Note: For Gaming set TV Brightness to Brighter, set to Game Mode On, and dial back the backlight, brightness and contrast and set color temp to Normal or Cool. Input lag is higher than most TVs on the market, so this may not be the best TV to select for gaming. 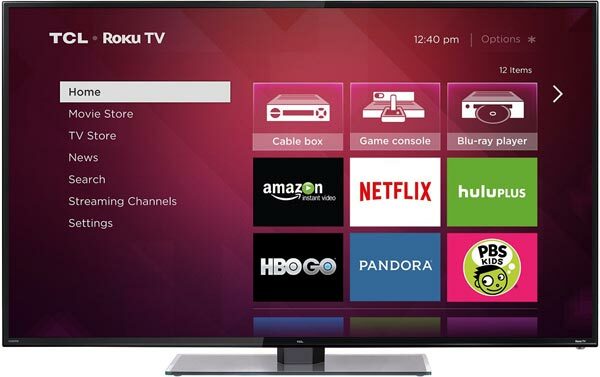 Roku is an excellent Smart TV platform, by most accounts the best in the market. I've used them for years and am on my second Roku (3) box, so their platform contained in a TV is always welcome. When you stop to think about it a second, the Roku 3 Box would cost you $105, and you get the same performance with this TV, so it's a great savings to have such a usable streaming system – a great option for cord cutters. After initial setup, the home screen appears with the big App boxes, with the easy and spectacular search function, the Channel store and the Settings. The selection of Roku Apps is the best in the market with around 1800. Many are useless, but all the best Apps are included like: Netflix, Hulu Plus, Amazon Instant, HBO Go, Vudu, Crackle, M-Go, Redbox Instant, TWC. Notably, HBO Go, Showtime Anytime, Rdio, and NFL Now are absent from most other TV manufacturers Smart TV suites. Roku's search function is also the best of any Smart TV. One advantage here is that you can compare prices of movies and shows before deciding which to purchase from. At times, a show or movie may be free by one provider such as Amazon Instant with a Prime membership, and costly on another such as Hulu. The TCL Roku Remote is really a Roku manufactured remote. Roku is good at operation, and I like the speed with which the small simple remote controls everything. The audio/volume buttons are located on the right side of the remote. It's easy to accidentally press the mute button. The picture and other menu settings are accessed from the asterisk wheel button. Conveniently, there are buttons for Netflix, Amazon instant, Mgo, and rdio on the remote face. There are free Apps for iOS and Android smart phones that even contain a voice controlled search. I did not try the voice search nor the smart phone App. But just know that it's an option. I like the simple Roku remote. Lastly, the dual band wifi did a very nice job receiving the signal even from 40 feet. Audio quality is generally poor with thin and tinny being two unwelcome traits, while there is little bass. The depth is not super sleek at 3.5 inches and the looks will not blow you away, but it's not bad looking and the new black frame is only .75 inches in width. The accompanying stand doesn't detract from the appearance like the feet from last year. At $399, and $499 for the 48” and 55” versions of the FS3750 this is a very well priced TV. It's not going to win best TV picture quality award, but if you watch a lot of streaming TV this could be your choice. It's a great option for a second or third room or vacation rental TV due to its complete Smart TV options.